For the third time in the last four years, the St. John’s Mavericks won the SPC wrestling championship. St. John’s had nine of its 14 wrestlers in the finals of this year’s meet. 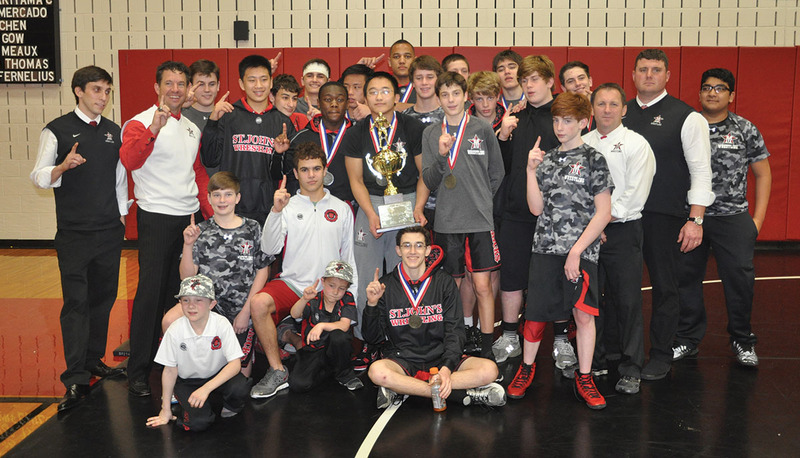 In simply dominant fashion, St. John’s School took hold of the Southwest Preparatory Conference wrestling championship for the third time in the last four years. The Mavericks topped the final leader board, scoring 212 points, with St. Mark’s of Dallas finishing a distant second (160 points). The first round was a precursor of great things to come, with St. John’s wrestlers ultimately advancing to the finals in nine of the 14 weight classes. Two of those wrestlers, Josh Thomas (220 lbs.) and Yo Akiyama (152 lbs.) won gold in their weight classes to qualify for the USA Prep Nationals. The other championship-round finalists included Ben Jacobs, Evan Eisenberg, Evan Hammerman, Layo Laniyan, Matthew Mercado, Peter Chen and Michael Meaux. Saint Thomas’ Episcopal captured both the boys and girls TAPPS Division III state swimming championships. The girl’s team included (from left) Emily Schwartz, Katie Flato, Olivia Lane, Hannah Hawk, Molly Egan, Sophie Close, Valerie Herrscher, Celia Houston and swim coach David Farfan. 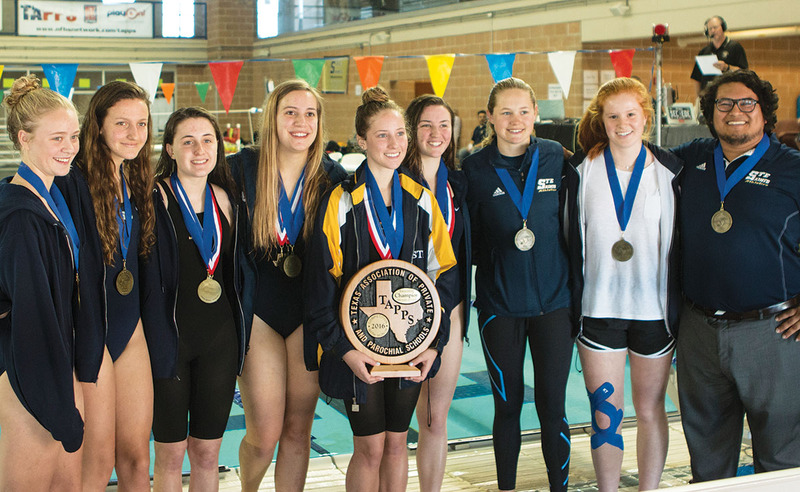 Saint Thomas’ Episcopal maintained its dominance in swimming, with the STE girls and boys defending their TAPPS Division III state swimming championship. It was sheer drama for both the boys and girls teams, with each of the state championships coming down to the final race of the meet. The STE boys were led by a sensational meet from James Finley, who, along with winning the 100 breaststroke and finishing second in the 200 IM, swam on the winning 200-medley relay and the third-place 400-freestyle relay. STE’s Micaiah Legaspi, Kenta Nebgen, Trent Jones and Joseph Lupski were all huge contributors in the championship victory. In a must-win, suspense-filled final race on the girls’ side, STE staged a dramatic come-from-behind victory to secure the state championship. Trailing halfway through the race, Hannah Hawk closed the gap with a tremendous third leg, and Olivia Lane brought the title home with a spectacular final leg for the STE victory. Earlier in the meet, Lane also won the 50-yard freestyle. Sophie Close, Molly Egan, Emily Schwartz, Katie Flato and Valerie Herrscher also helped lead the way for the STE championship. “All that amazing hard work and endless 5:30 a.m. workouts paid off for our kids,” said Farfan. In basketball, it’s been the best season in school history for Duchesne Academy, which entered the post-season playoffs with a lofty 24-4 record and a No. 13 statewide ranking among all large private schools in Texas. That group of girls includes standout point guard Gaby Castillo, who averages 12 points and eight assists a game. “It means a lot that we’re making school history. We’re having a lot of fun in the process,” said Castillo. Her sister, Alex Castillo, is the team’s leading scorer with 21 points per game, while Ilya Babineaux gives the team a major inside presence with 16 points and 13 rebounds per game.